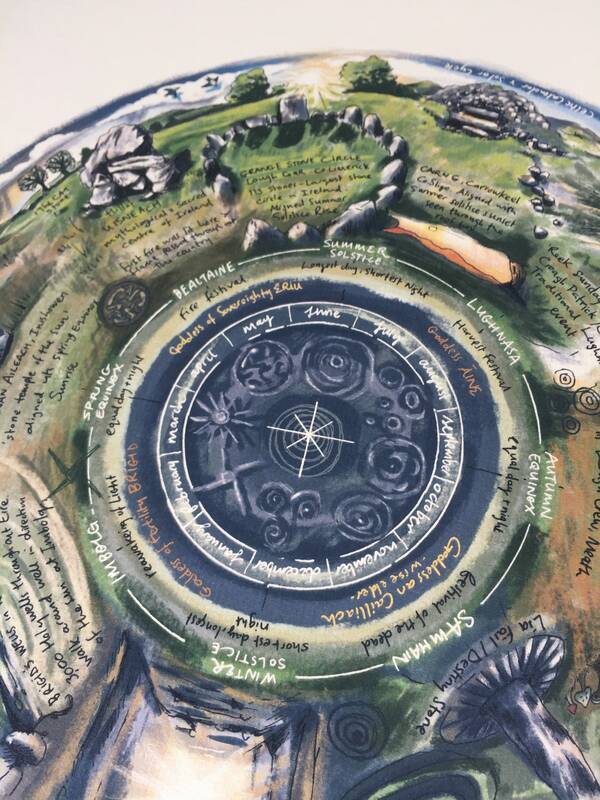 Ireland has thousands of sacred sites, from ancient Passage tombs, Stone circles and Portal dolmens to Ogham stones, Holy Wells and Sheela Na Gigs which are dotted all over our landscape. 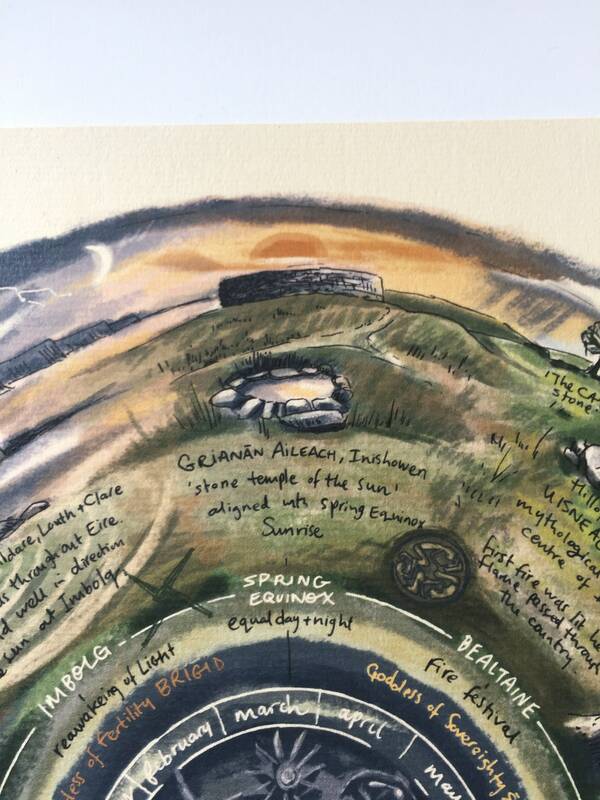 Many of these sites were specifically designed to facilitate a particular solar alignment, such as, the light of the rising sun spilling down the passage and into the chamber at Newgrange on the Winter Solstice. These mysterious sites can lift us out of our everyday experience and reconnect us to nature, the land and our ancestors. 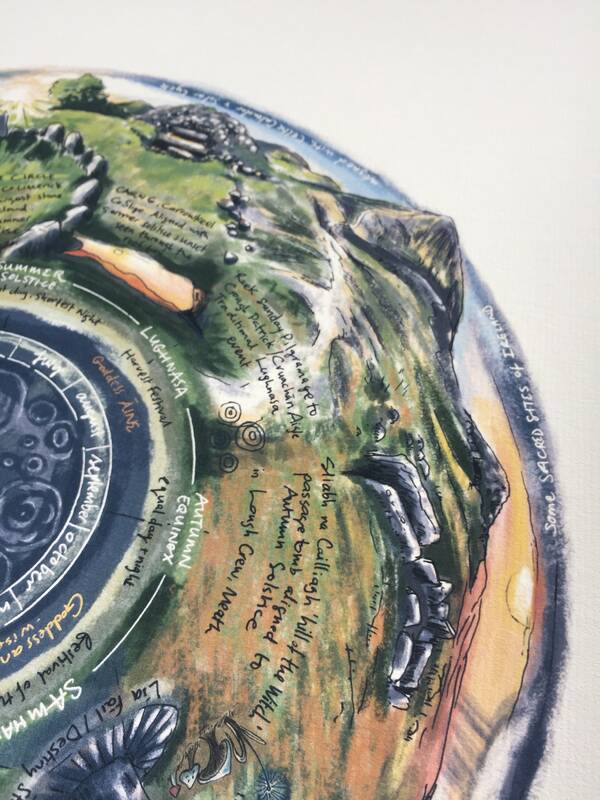 This print illustrates a handful of sacred sites with a significance to certain points on our Celtic Calendar. 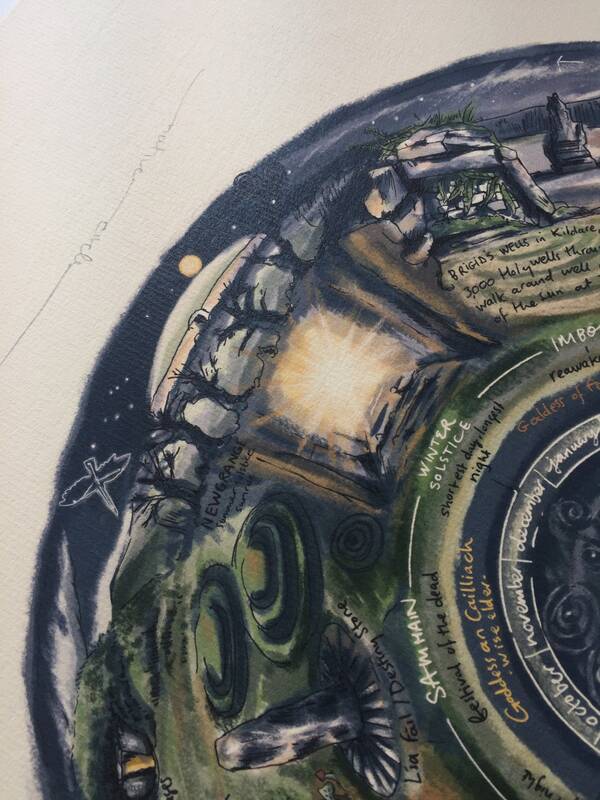 Archaeologist and Mindful explorer Deirdre Kavanagh is the expert behind this piece. Native Circles are a set of simple illustrations that create space for nature connection and self reflection in our living space. Think of them as a field guide to a simpler life more connected with the wonder of the natural world. 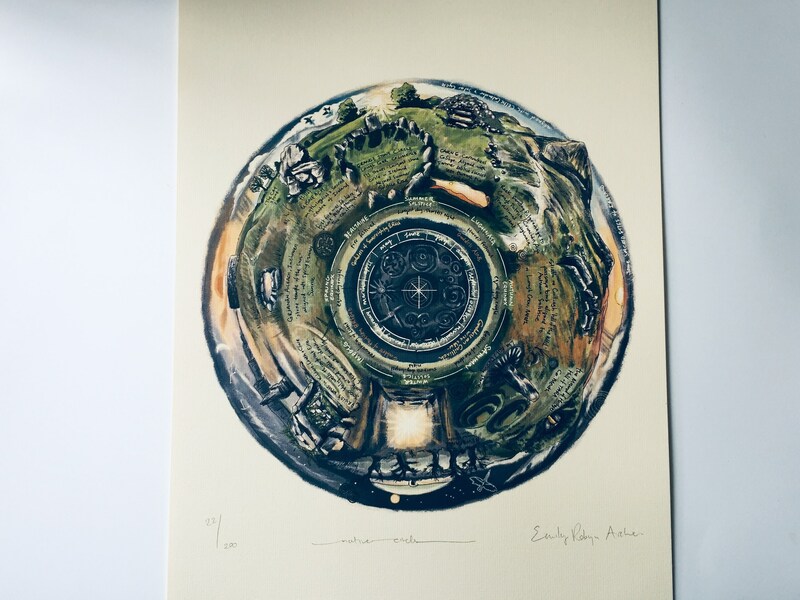 Prints are from original pen drawing by artist Emily Robyn Archer. Not yet an option but could be looked into if there was a certain demand. Get in touch and lets talk. 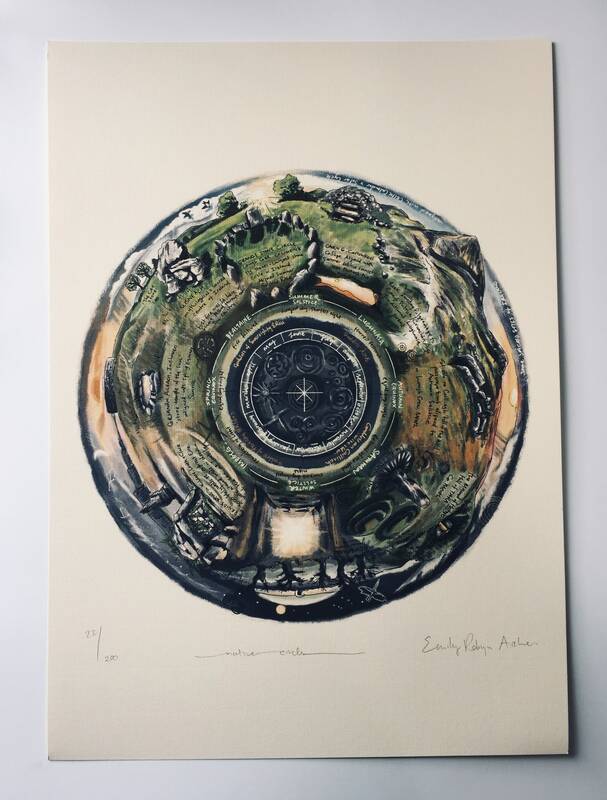 Limited edition prints: definitely best to get them professionally framed, or buy a A3 size frame for them yourself. I can offer a bespoke framing service for those within Ireland and parts of the UK. Birchwood Wheels: these are designed to be handled. I see them being taken of the stand regularly, being shown to kids, played, used in a yoga studio- whatever. So I have designed them to be pretty robust. They are on 4mm Birch Plywood, and have been sealed with a light coat of matte varnish. So they are designed to be used and handled but they should be treated with care also. 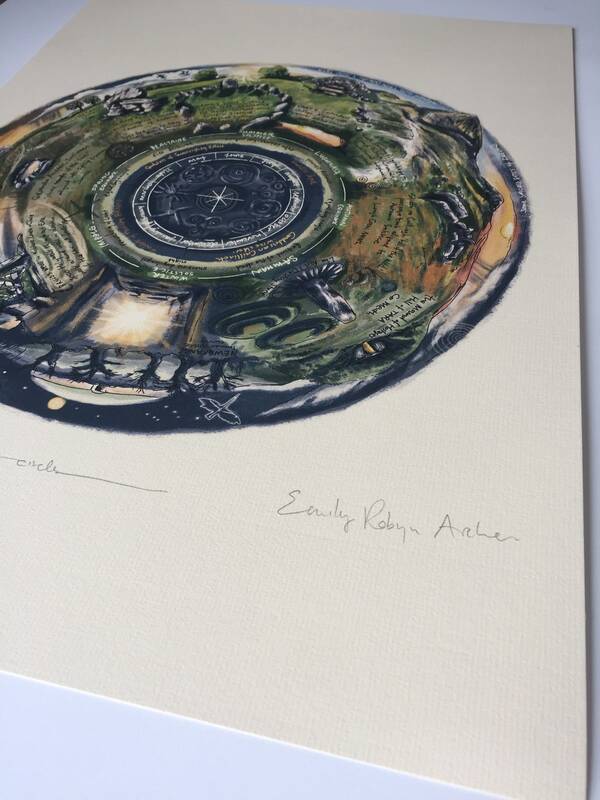 Limited Edition prints are on SRA3 Paper 450mm x 320mm. I wrap usually in a delicate uncoloured recycled tissue paper followed by recycled brown paper or something similar. I use natural flax twine of recycled coloured string. I include a recycled luggage tag and everything is stamped with the Native Circles stamp. © 2019 NATIVE CIRCLES ART .